Erik Peitz, named the 2019 Chamber chairman, was born in a suburb of Milwaukee, WI. As a child, his family moved to nearby Racine, WI where he attended Case High School. Growing up in Wisconsin, Peitz was surrounded by extended family, which helped to shape his strong family values and a large network of close friends. His parents started their first company in 1992, which laid the foundation for his tireless work ethic. Peitz graduated from Case High School in 1999 and began working fulltime for his family’s new business, Custom Mechanical Equipment, or CME. Peitz started working alongside his father and grandfather at a young age. He made service calls and took business trips with them during summers and any time he was not in school. His father insured he would know every aspect of the company, so Peitz worked in every shop position within CME. He then moved into the office as an engineer, all the while traveling to job sites all around the United States and Canada. In 2003 the Ponca City Development Authority offered great business incentives to the growing company, so CME and the Peitz family made the move to Ponca City. Peitz was then promoted to General Manager and since has been instrumental in expanding the business. Fabrication work with various oil companies began in 2013, Custom Powder and Blasting opened in 2015 and most recently Source Fabrication was added in 2018. Currently, Peitz is the Vice President of Custom Mechanical Equipment and co-owner of Source Fabrication. Since moving to Oklahoma, he has been actively involved and invested in the Ponca City community. He has been a coach for the Ponca City Youth Football league since 2011. 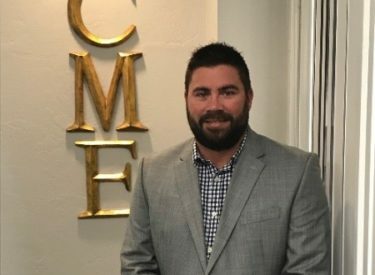 He became a Ponca City Chamber of Commerce board member in 2014, was asked to join the executive board in 2017 and will be Chamber Chair in 2019. He continues to serve on various committees as an executive board member. In addition to his active participation in the Chamber, Peitz volunteers on the Maintenance Committee for the Ponca City Country Club and for numerous school/activity functions for his children. Recently, he volunteered his time as Campaign Manager for the successful District Judge campaign and continues to use his love of cooking to benefit various local charities. He is married to Laura Peitz, a Licensed Professional Counselor with a local private practice. They have two beautiful and active children, Evan and Lilly. When not working or volunteering, Peitz enjoys hanging out with family and friends, cooking, attending concerts, and traveling.